Introduce young students to the concept of maps as representations of places with this park map. Students in early elementary commonly draw their view of the world using the perspective seen in this map. Students can use maps with this perspective to begin to learn spatial concepts such as identity, location, and symbols. They should be given opportunities to practice with maps of familiar places, like a park. At this age, symbols should represent an object or place in the real world and be a recognizable icon to students. Abstract, unrelated symbols are not understood well at this age. 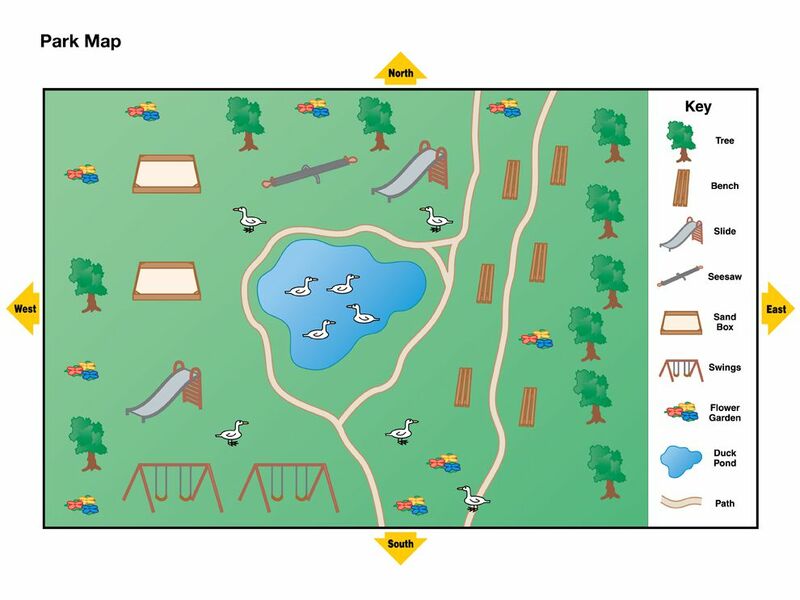 Use the text and prompts below to explore the provided park map with students. A park is a place where people play, enjoy nature, exercise, and have fun. Look at this map of a park. It shows play areas, walking paths, and some of the nature you can find in the park. It includes a map key with symbols. Parks provide places for people in the community and visitors to sit and enjoy nature. Look at the map key to find the symbol for a bench. Find the benches on the map. How many are there? What could you see if you sat on one and looked north, south, east, and west? What other places on the map might be a good place to enjoy nature? What is between one of the slides and a sandbox? What is the line that circles the pond? If you were on the seesaw and looked east, what would you see? What are the swings next to? In what direction would you walk to get to the duck pond from the benches? If you walked south on the path, what animal might you run into? Have students create their own maps of a local park. Make sure they include a map key with symbols. They can trade maps with a partner and ask questions about each other’s maps to explore them. Sobel, David. Mapmaking With Children: Sense of Place Education for the Elementary Years. Portsmouth, NH: Heinemann, 1998. Find the full collection of community maps for use with students in Grades preK-2.